Ordered pair - graphing games. Kids get to learn all about plotting ordered pairs the fun way. Decide which player will go first. The first player rolls the pair of dice and adds the two numbers to get the sum. The player jots the sum down on their paper so they won’t forget. The player rolls the pair of dice again and sums the two numbers. Next, the player takes the two sums of their rolls and creates an ordered pair. It’s up to them which number they put first and which number second. For example: Player 1 rolls the dice and gets a sum of five on the first throw. On their second throw, they roll a sum of eleven. So Player 1 can use the ordered pair, (5,11) or (11,5). 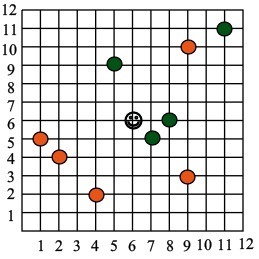 After deciding which ordered pair to use, the player places their colored marker on that point on the game grid. Be sure the players understand that the first number represents x and the second number represents y. If a player rolls doubles, they get to roll again on that same turn. If this is the case, they place a marker down on an ordered pair as before. Otherwise the second player takes their turn by rolling the dice and placing their marker on the game grid as explained above. If a player rolls the dice and comes up with an ordered pair that is already occupied on the game grid by the other player, they will get a chance to “Bump” the other player from that spot. The Bump: In order to bump a player, both players will roll the dice separately. The bumper gets to roll last. The players sum the two dice and the player with the highest sum gets to stay on that ordered pair. Notice on the game grid the ordered pair (6,6) has a circle on it already. If a player rolls double sixes, they are allowed to move their marker to any ordered pair they choose! Players continue taking turns until in this manner. The first player to place 4 markers in a row horizontally, vertically, or diagonally is the Winner! If you're looking for more advanced graphing games, we'll be adding some soon. You might also enjoy graphing games that can be played online.